The PC release of FFVIII comes complete with achievements, the Chocobo World minigame, and a sense of confusion over the ending. Get out your Triple Triad deck, because Final Fantasy VIII is now available on Steam. 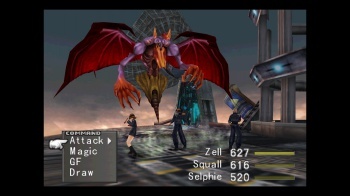 Originally released for the first PlayStation in 1999, FFVIII saw a PC release the following year. Now gamers can once again experience the epic saga of soldiers, sorceresses, Guardian Forces, and really cool facial scars for $11.99. Sorry, Mac users--it's PC only. For the uninitiated, FFVIII introduces Squall, a teenage student at a military school, as well as some of his classmates and teachers. Before long, Squall and company are promoted to elite mercenaries and wrapped up in a battle against several powerful sorceresses and an ultra-competitive sociopath. The main game is great and all, but the real gem is Triple Triad, the in-game card game that will have you obsessively battling strangers hoping to find rare cards. The Queen of Cards quest may consume you, but it'll be worth it to get that Chubby Chocobo card. The Steam version of FFVIII comes with achievements, the Chocobo World minigame that originated on Japan's PocketStation accessory, and a Magic Booster. On top of having a classic RPG made easily accessible, you'll also have a reason to revive that 14-year-old argument over FFVII's Materia vs. FFVIII's draw system with your Final Fantasy-loving friends. Of course, anyone who thinks the draw system is better should be cut out of your life entirely.